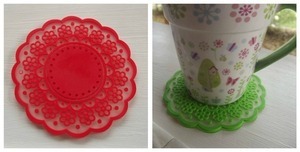 Today we have on offer some gorgeous shabby silicone lace coasters. They come in an assortment of colours and are the perfect gift for anyone who loves pretty girly items. Each coaster is just $4.50 and is POSTED FREE to Australian Buyers and for just $2.00 to Overseas Buyers. We also had some more of those popular Button Coasters but they sold out by 9am. Is there anything that you would like to see us offer as a Daily Deal. Let us know. Pop over to the Daily Deals store to see today's deal - Don't forget to check out the clearance bin.